Samsung’s got a new Android tablet, and it may be coming soon to T-Mobile. 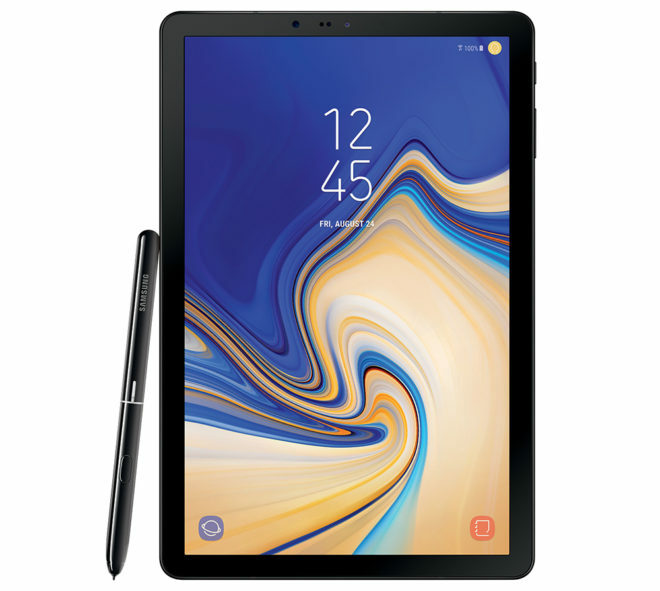 The Samsung Galaxy Tab S4 is a high-end Android tablet with a focus on productivity. It’s got a 10.5-inch 2560×1600 Super AMOLED screen with a 16:10 aspect ratio and comes with an S Pen stylus. With the S Pen, you can do things like translate and organize notes in the Samsung Notes app. Samsung has also equipped the Galaxy Tab S4 with Samsung DeX functionality. When docked in the Book Cover Keyboard or launched from the Quick Panel, Samsung DeX will give you use a more desktop-like experience, complete with multiple desktop-style resizable windows for your Android apps. You can also drag and drop content between apps and use keyboard shortcuts and commands. And if the Tab S4’s screen isn’t big enough for your needs, you can use an HDMI or USB-C multi-port adapter to connect it to an external monitor and use the tablet as a trackpad, sketchpad, or full Android tablet. Powering the Samsung Galaxy Tab S4 is an octa-core Snapdragon 835 processor paired with 4GB of RAM. There’s a 7300mAh battery powering the whole package and fast charging support to help you recharge that battery in a hurry. Other specs of the Tab S4 include 13MP rear and 8MP front cameras, iris scanning, 4 speakers tuned by AKG, and Android 8.1 Oreo. The Samsung Galaxy Tab S4 will be sold in 64GB and 256GB versions. Both models include a microSD card slot, though, so you’ll always be able to add more storage if you need it. Samsung plans to sell Wi-Fi-only models as well as LTE variants for Verizon, Sprint, and U.S. Cellular. Reports from Engadget and CNET today say that T-Mobile will also be among the U.S. carriers that sell the Galaxy Tab S4, but when contacted for confirmation, Samsung said that it didn’t have any additional carrier info to share right now. T-Mobile hasn’t responded as of this post’s publication. The Galaxy Tab S4 will go on sale on August 10th, with pricing set at $649.99 for the 64GB Wi-Fi model and $749.99 for the 256GB Wi-Fi model. 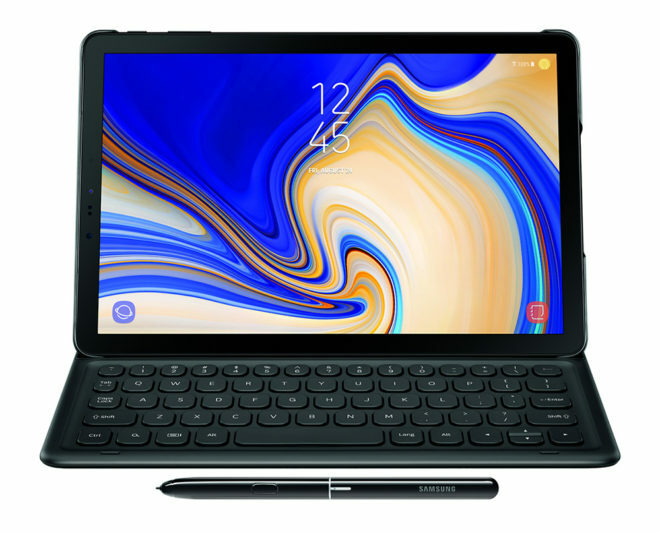 You can pre-order the tablet right now from Samsung, and if you do decide to pre-order, you’ll have the option of buying the Tab S4’s Book Cover Keyboard for half off. This accessory normally costs $149.99. Samsung’s Galaxy Tab S4 is definitely a premium Android tablet and it’s got the price to match. There aren’t many options out there for new Android tablets lately, though, so if you’re set on getting an Android tablet, you don’t have many other options. The good news is that at least the Tab S4 offers some upgrades over the Tab S3, like a bigger and higher-res display and a considerably larger battery. Would you buy the Galaxy Tab S4 if it launched at T-Mobile? even if it comes to tmo, no band 71 according to fcc cert. Tablets are always behind on supporting new bands and technologies. This is seriously overpriced when compared with ChromeBooks, Surface Go or iPads. I’ve seen pixelbooks on sale for less than this plus its keyboards. No, it is only a tiny bit overpriced when compared to the Surface Go or iPads. Chromebooks and Surface Go in general specs are what itsi worth, while with the S4, you are getting the later Snapdragon like in Note8, great software festure on Samsung can bring. iPads arw just bigger iPhones and are definitely over price like iPhones themselves. I agree, this is very pricey but anyone who owns a Tab S knows it’s the Super AMOLED display that makes it superior to the iPad and Chromebooks. From what I have read, this tablet is actually slightly cheaper than the iPad pro models with accessories it was made to complete against. So no, it’s not over priced compaired to the competition. This tablet had superior tech compared to the competition. The ipad pro 64gb is $775 for the LTE model. And don’t forget to add the $100 for the apple pen. Vs. The free one with the tab S4. Both the ipad pro and Tab S4 are going for $650 for the wifi models. I literally just Googled both. iOS and Android are two completely different platform, made for completely different people. That’s why iOS will win every-time. When was the last time you went into a shop and paid for something and completed your purchase on an Android tab? NEVER! IPad’s literally pay for themselves – business wise. Only $650? Come on why not $1000? Considering android tablet market is pretty much dead. I’d rather get a laptop for that price. Great. I am waiting for a Tab S3 sale. Only Verizon carried the LTE version of the Galaxy Tab S3. T-Mobile passed on it and stopped selling the their Tab S2 models once their inventory was depleted. T-Mobile’s current Android offerings are very low end – low memory, small batteries, old versions of Android with ancient processors. I get it that the tablet market contains to shrink because of increasing smart phone screen sizes and lack of app support for Android tablets. Still, it would be nice to have an Android alternative to Apple’s iPad. I literally just closed my line on my account with the original Jump! plan that my Galaxy Note 10.1 2014 ed. was on a couple months ago! I had given up on T-Mobile ever carry a worthwhile tablet to replace it with after this long! I know how you feel, I’ve been waiting over a year for them to carry a non I-Pad tablet. I got one off end bay,it great!! I got for really good price. Wish Tmo,would l go out get Surface Go,since they suppose to have lte model too. If you could mark pdf’s in different colors, and easily save and print… LTE present…IF .. .. 10″ kinda small though .. If only Android would make Tablet dedicated apps like Apple does I would actually buy one but until then I’m sticking to an iPad. No doubt about it, I would most definitely buy the Galaxy Tab S4 if TMobile launched it! Meanwhile, I’ll be waiting, I’m Looking forward to it! Samsung should make this into windows tab,or Tmo,should go out sell The Surface Go,with the lte model. Absolutely I would buy this tablet if launched at T-Mobile!! Of course, I love Samsung tablets. I am considering switching to Verizon because they stopped offering high-end Samsung LTE tablets. I will wait to see if this one is coming to T-Mobile. Absolutely!!! Please launch this with T-Mobile! I have temporarily gone to an ipad pro which isn’t bad but I would soooo much rather have a Samsung again. I’ve decided to buy the LTE version of this tablet if it comes to T-Mobile. Be sure to let us know of further developments ! PLEEEEEAAAASSSSEE start offering this NOW, T-Mobile!! Love T-Mobile, love Samsung tablets and my S2 is dead, so I need a fix! Absolutely T Mobile lets get on the ball, You need a decent Android Tablet to offer, my S2 is showing its age as well. Apple is not acceptable !!! I ended up selling the craPad after struggling with constant work a rounds and its lack of being productive. Please T-Mo we need better tablets for business like the Tab S4 please.